Sometimes you want to follow high volume publications like The Verge, NY Times, or VentureBeat because you trust them but you are only interested in narrower topics, trends, or mentions. Reducing noise and information overload is a problem we care passionately about. We have been working over the last 12 months on a new feature called Leo. 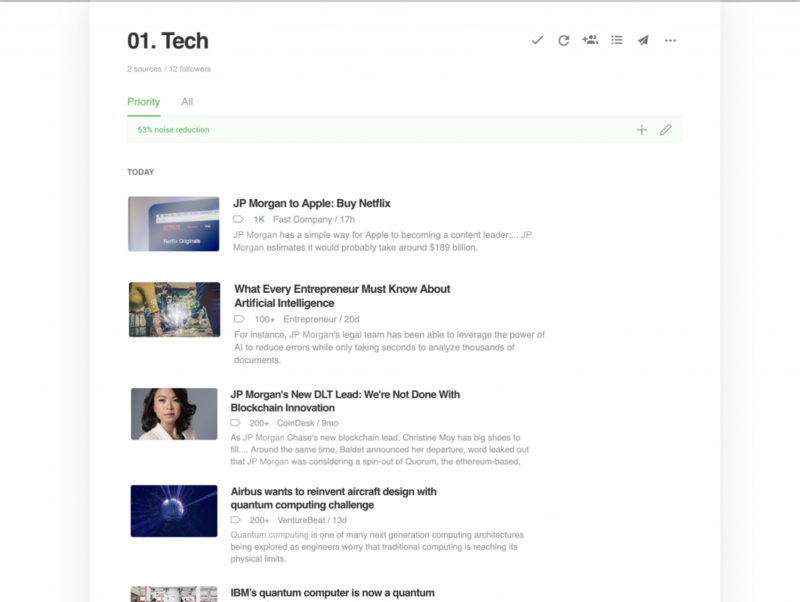 You can think of Leo as your non-black-box research assistant – an easy-to-control AI tool which helps you reduce noise in your feeds and never miss important articles. Here is a quick overview of the Leo 0.5 Beta feature set. If you are part of the Leo 0.5 Beta Program, each of your feeds has now 2 tabs. The All Tab includes all the articles published by the sources you follow. 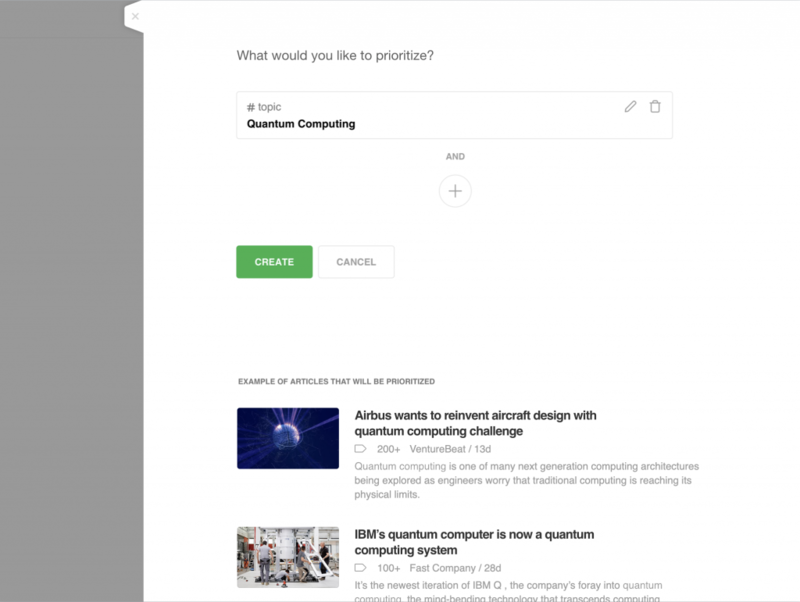 The new Priority Tab includes the subset of articles flag by Leo as important – based on the priorities you defined for your Leo. 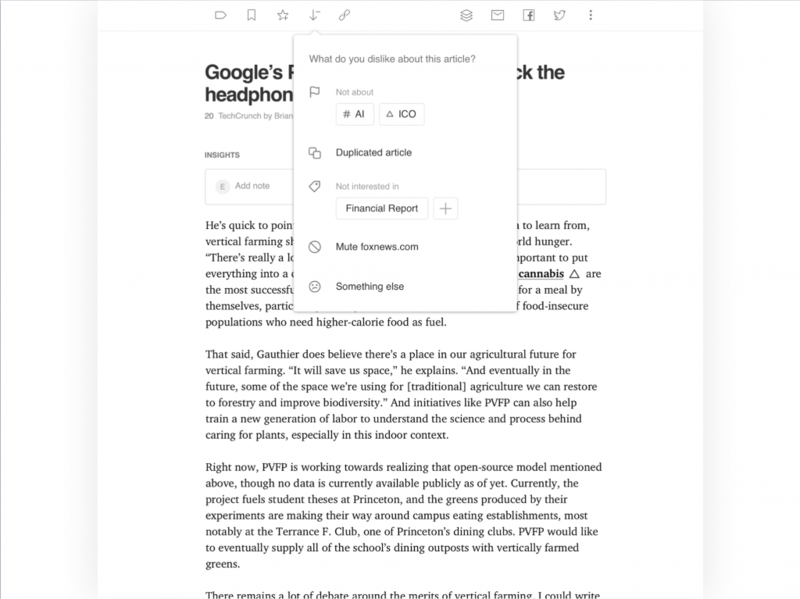 Leo 0.5 ships with three core skills: mentions, topics, and like-board. Each of these skills allow you to prioritize articles differently. 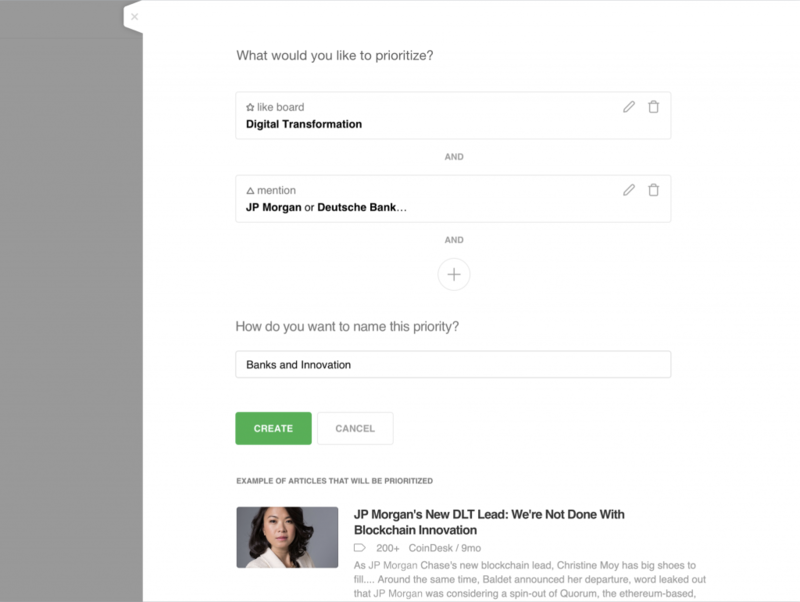 The mentions skill allows you to prioritize articles based on mentions of people, company or keywords which are important to you. The topic skill allow you to prioritize articles which are about a specific topic you are interested. 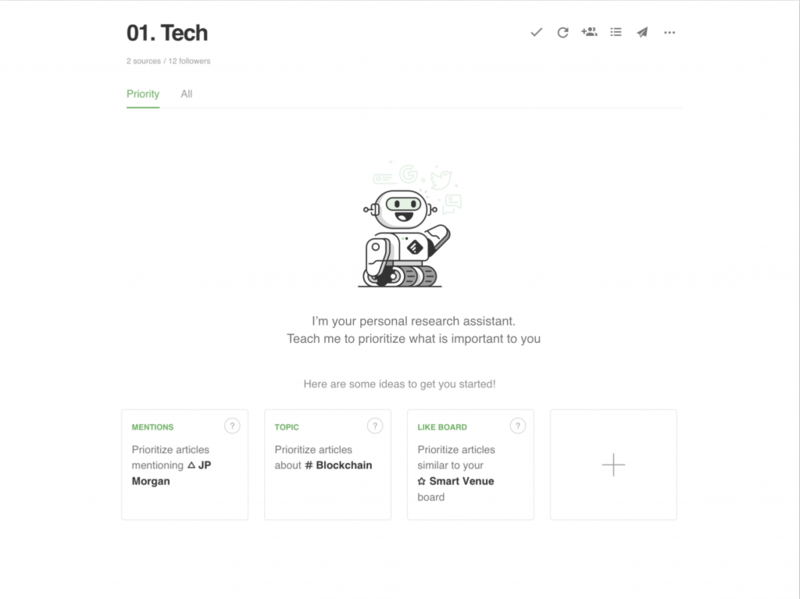 For example, you can ask Leo to analyze your tech feed and prioritize articles which are about artificial intelligence, quantum computing, or gaming. Leo ships with one thousand pre-trained topics. If the topic you are interested in is part of that list, the topic skill is a powerful tool to let you focus your feed on what really matters to you. Sometimes, the topic you are interested in a very niche. This is where the Like Board skill is very useful and powerful. For example, if you are in the Sports industry, you might be interested in the emerging Smart Venue trend. 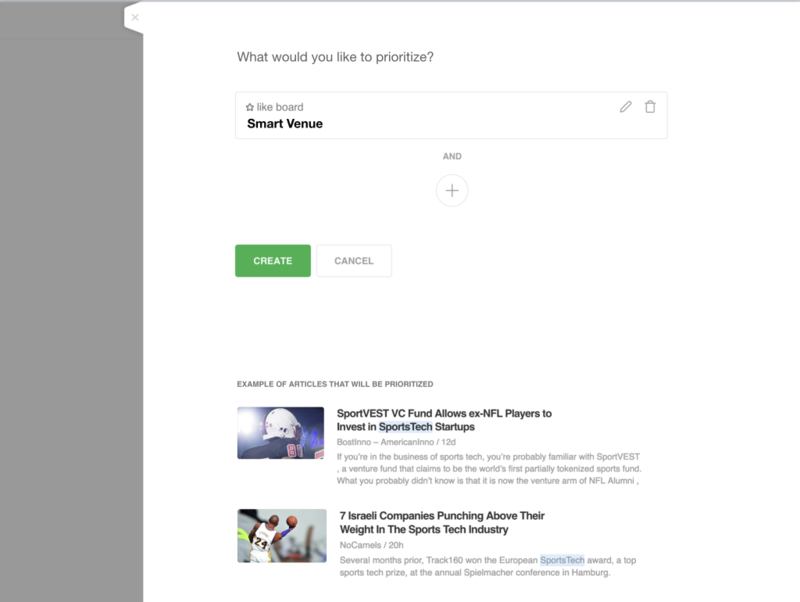 Leo does not know out of the box about Smart Venue but if you can create a board and save 30-50 articles about Smart Venue, you can use the Like Board skill to teach your Leo a new personalized topic and ask Leo to prioritize future articles which are similar to the ones you save in that board. Once you have defined the priorities of your Leo, he will continuously read your feed and flag articles which are aligned with those priorities. The Like Board is particularly powerful because the more articles you save to that board, the more accurate Leo’s recommendation will become. Finally, you can easily define more sophisticated priorities by combining multiple skills/layers. When Leo makes a back prioritization, you have the control to provide him feedback via the Less Like This button. The “Not About” feedback allows you to teach Leo that it matched the wrong keyword or topic. For example, you were interested in ICO (Initial Coin Offering) and Leo detected ICO (Internet Commissioner Office). 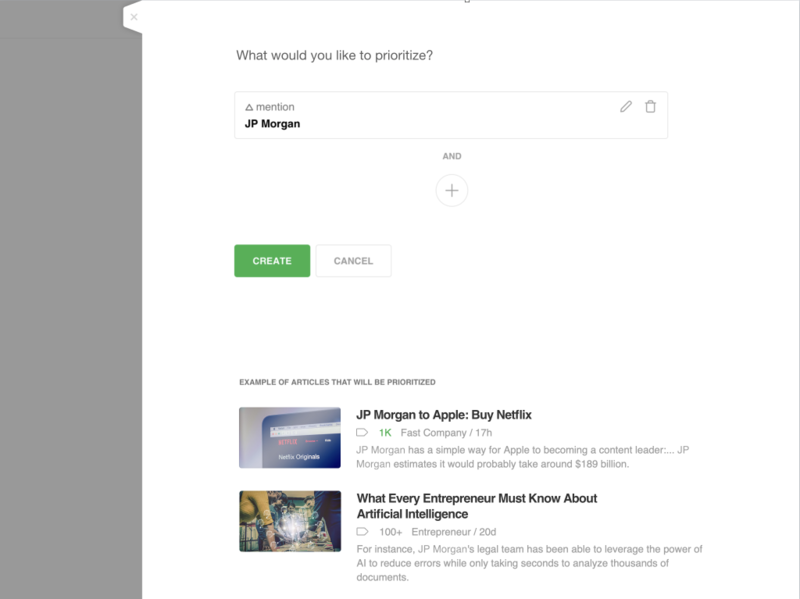 The “I’m not interested in” feedback allow you to flag class of articles you are not interested about. For example, you might not be interested in market research type articles. If you can flag 10-20 articles as I am not interested in market research, Leo is going to learn and start prioritizing fewer market research articles. Sometimes (specially for keyword alerts), you might get articles from sources you do not care about. 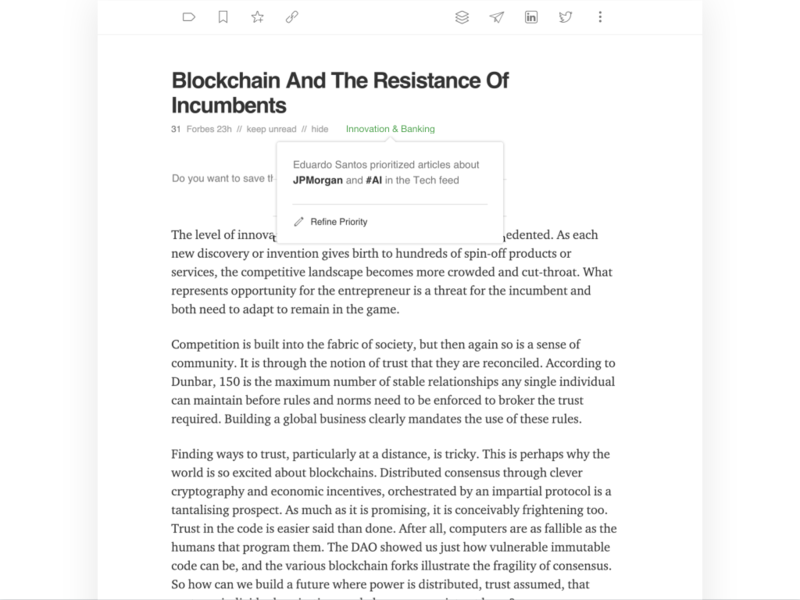 The ‘mute domain’ feedback allows you to train your Leo to mute articles from those domains. Finally, sometimes, the reason is more complex. The ‘Something else’ feedback offers you an easy way out. A very important aspect of the Leo promise is that it is a fun, non-black-box AI you fully control and can easily collaborate with. Transparent because each time Leo makes a prioritization, he will explain why the article was prioritized and give you the opportunity to refine that prioritization. Control because you explicitly define all the priorities of your Leo and you can at anytime go in the Train Leo section and remove or refine a priority. No black box. No lag. Leo 0.1 Alpha customers saw 40-70% noise reduction on their feeds. 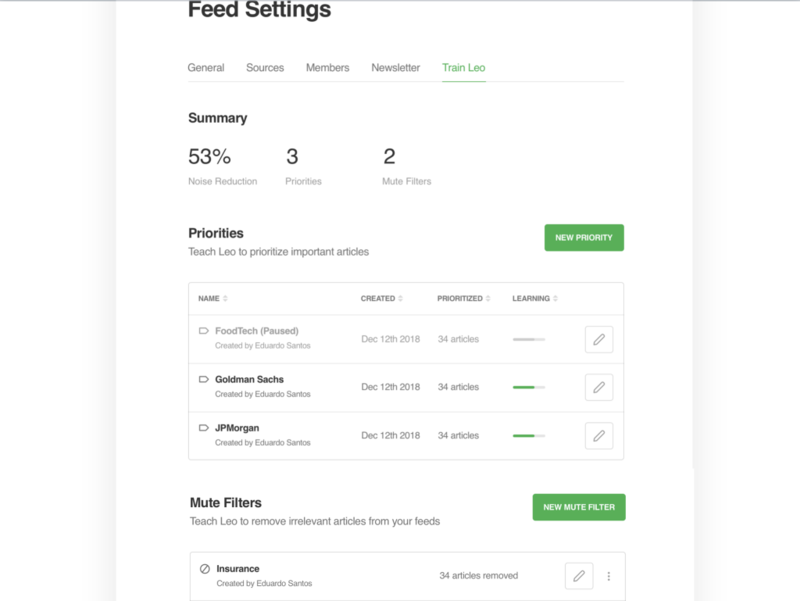 More targeted feeds mean that you can save time while reducing the risk of missing important articles, or being the last to know about an important risk or market opportunity. We look forward to seeing how your will be training your Leo!